Why an Implant Supported Prosthesis? A Failing Dentition or Missing All Teeth? At a certain time in our life we may be faced with dental conditions where we have a failing dentition or are missing all of our teeth. It can occur in one arch or in both arches. Failing teeth should be removed for health concerns, aesthetic reasons and for comfort. Generally, these teeth are broken, loose, shifted, infected and uncomfortable. 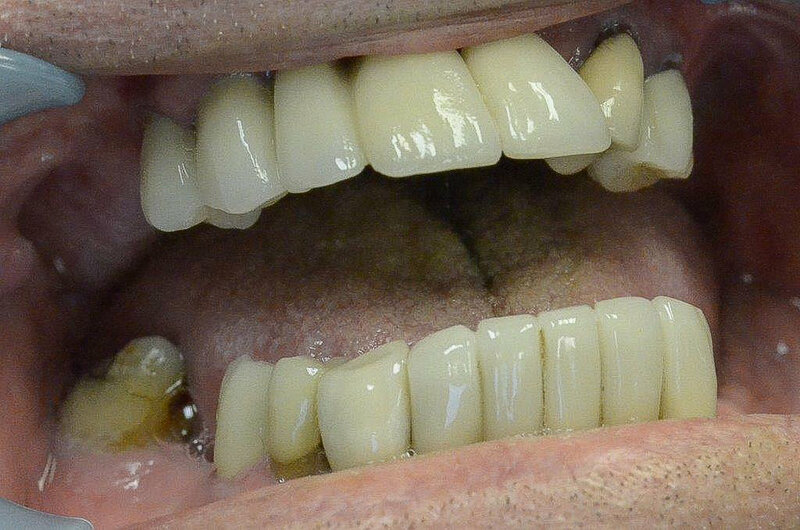 In the past, these teeth were removed and a complete denture was placed to restore the missing teeth. Today, we can replace them with Same Day Teeth, a fixed and non-removable replacement at the time of surgery. Sometimes this is referred to as the “All on 4” procedure. An “All on 4” is just one option that we offer at the Center to replace teeth. From a diagnostic determination, we may prefer another fixed option for you to optimize bone support, the lack of bone or to improve esthetics. Sometimes a fixed option may not be the best for you and a removable implant supported option may be the best. There are many reasons for the removable prosthesis and they can range from easy of cleaning, proper lip support, anatomical or/and financial reasons. A fixed prosthesis can be supported with 4 or more implants and is determined by a diagnostic evaluation and your personal desires. We performed our first fixed prosthesis in 1985 and have helped in the design of today’s modern prosthesis. Working with Cagenix, an implant device company located in Memphis, the Center has developed many alternative options in the design, materials and custom aesthetic prosthesis for a fixed prosthesis. In the development of these new products, we have performed a number of clinical trials that has led us to develop new surgical procedures and restorative options for patients and doctors nationwide. It is the combination of over 30 years experience along with an oral and maxillofacial surgeon and a prosthodontist that allows us to reliably perform these procedures within one facility. After a thorough evaluation and diagnosis, a treatment plan is made and presented to you. From this same information, the surgical plan is determined and a fixed provisional prosthesis is made. Immediately after surgery, the provisional is inserted to give you non-removable teeth that will help you chew but more importantly, give you the confidence to smile again. With the removable prosthesis, 2 to 4 implants are placed and the prosthesis fits over the implants. The prosthesis can be retained with attachments on 2 implants or with a titanium bar and attachments on 3 or 4 implants. With 2 implants the prosthesis will cover the palate or roof of the mouth and have some mobility from tissue support. With 3 or 4 implants the prosthesis can be in a U shape and will not cover the palate or roof of the mouth and have less mobility with less tissue support. The more implants retaining the removable prosthesis, the more retention and the greater the ability to chew foods normally. The removable prosthesis can be indicated for patients that need additional lip or facial support, that have lost bone support and that have special esthetic needs. A removable prosthesis is easier to clean but may not be indicated for patients with dexterity limitations. We would love to schedule an appointment for you. Contact our office for our next appointment.